Construction is to start shorty on an upgrade of the Great Western Greenway between Westport and Achill in Co Mayo — the project will take greenway user off a busy rural regional road. Currently the western end of the greenway ends short of the end of the former railway, which means users have to take to the main road if they want to travel to or start at Achill Island. 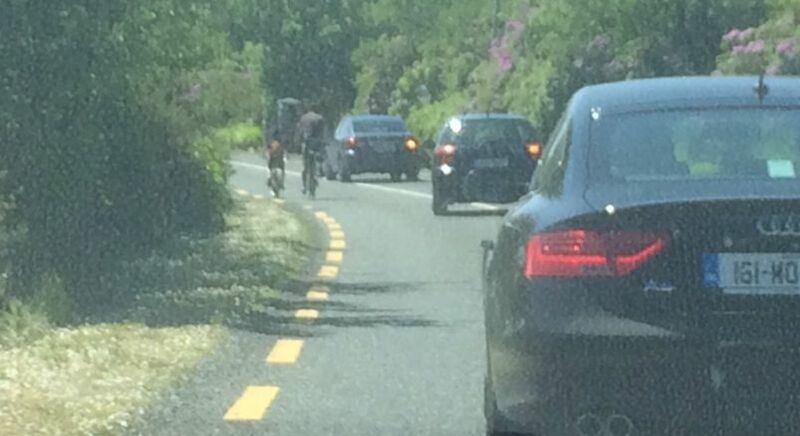 IMAGE: Greenway users on the main road east of Achill Sound. The greenway extension will mean that users traveling to Achill Sound village will be taken away from the main road for longer and will only join the main traffic route in the village of Polranny where there is a footpath and a 50km/h speed limit applies. Connected by a bridge, Polranny is on the mainland and Achill Sound is the gateway village to the rest of the island. Currently the route along the former railway line ends 1km short from the old Achill railway station, located beside the bridge to Achill Island. It means that greenway users wanting to travel to the island are diverted onto a busy regional road for around 1.3km, around 700 metres of which is on a narrow road with a 80km/h speed limit. MORE: Read the full story on mayonews.ie. Great news. I hope to cycle out there from Dublin at some stage to have a go on the greenway. It is a beautiful greenway, but the last part could be uncomfortable for less confident cyclists. Kudos to the country council for persisting. I haven’t cycled on Achill island but suspect it will be the best part – on a sunny day. Given that we are talking about a stretch of former railway line, shouldn’t the landowner be the state? Or was this land given away as was the case in South Kerry, that is now putting that greenway project in jeopardy? Does the landlord in this case reserve the right to withdraw access on a whim? Having cycled this greenway with a group of eight in 2014 and included the Atlantic Drive around Achill in superb weather we all found the final approach to Westport challenging and puzzling. After all the rail line must have ended at a station in the town so why did the greenway have to take a route through an industrial estate with no signage to the town centre?